When Azamara Journey docked in Reykjavík–the northernmost capital city in the world–we eagerly hit the streets of this beautiful, relaxed and pedestrian-friendly city. Our first stop was the impressive Halllgrímskirkja Church. This Lutheran church is certainly Iceland’s most iconic structure. Although the design was completed in 1937, the church was finished only in 1986. Light fills the soaring nave, and the church is sparsely decorated in the long-standing Nordic tradition of simplicity. The imposing church tower, accessible by elevator for a small fee, provides the best view of the capital city and the harbor. The square around the church enabled us to get the full impact of the spire, and enjoy the buzz of visitors from all over the world. Skólavörðustígur Street runs straight down the gentle hill from Hallgrímskirkja, bringing you close to the harbor and to Harpo, the beautiful new concert hall on the waterfront. We were pleasantly surprised by the lack of international chain stores and fast food restaurants in this busy area of Iceland’s capital city. We felt tempted by the beautifully made, local wool sweaters, scarves and hats, but deemed them impractical to wear in our home city of Phoenix. Many small shops carry Viking-themed wooden carved items and other handcrafts. Even more shopping options can be found on nearby Laugevagur Street. One shopkeeper told us that formerly, hot springs ran along this street, making it the center for locals to do their laundry. Our conversations with Reykjavík residents gave us insights into how people live in this northern country. We learned that virtually all homes and other buildings in Iceland have geothermal heating and hot water. Wind-generated power is growing in use as well, giving Icelanders a leg up on sustainability, an important cultural value here. 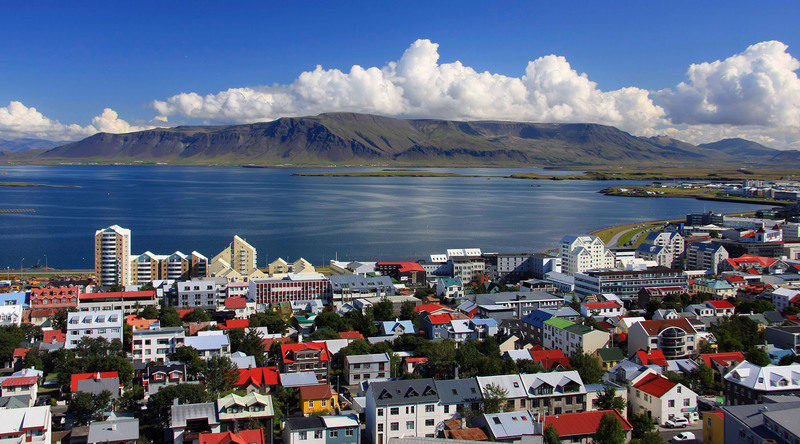 Even in Iceland’s capital city, an increasingly popular cruise port and tourist destination, we felt the power of the geographic landscape. Hissing volcanoes, the risk of floods, mudslides, and earthquakes remind Icelanders and visitors alike of nature’s potential for change and destruction. In Iceland, the land itself is very much alive and active.